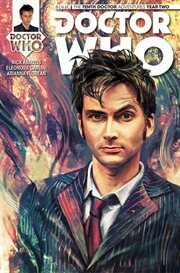 The item Doctor Who : the Tenth Doctor #2.6, Issue 2.6, (electronic resource) represents a specific, individual, material embodiment of a distinct intellectual or artistic creation found in Richland Library. The Doctor and Gabby arrived in ancient prehistory, only to be attacked by giant, sentient, flying metal discs. The Neanderthal Medicine Man, Munmeth and the time-travelling duo set out in search of these discs, which had been kidnapping groups of humans - Neanderthal and Sapiens alike! Their nefarious purpose: pitting human species against one another in a gladiatorial arena of death! With the help of a gang of intergalactic bounty hunters who have followed the Monaxi discs through space and time, the Doctor, Gabby and Munmeth attempt to put a stop to this cruel sport... but it seems as though they've only succeeded in angering the enemy into creating a temporal tornado. What could be waiting for them on the other side?